Rawat, who arrived here yesterday, was briefed on the prevailing security situation and recent operations conducted by the security forces. SRINAGAR: Army chief General Bipin Rawat on Friday paid homage to the three soldiers killed in Thursday’s militant attack in South Kashmir and called on security agencies to effectively deal with stone pelting by civilians during counter-militancy operations in the Valley. General Bipin Rawat, who arrived here on Thursday evening, visited the Victor and Kilo Force Headquarters in South and North Kashmir respectively on Friday to review operational preparedness of the troops. “The army chief was accompanied by Northern Army commander Lt Gen D Anbu and GoC 15 Corps Lt Gen J S Sandhu. During the security review meetings, the army chief was briefed on the prevailing security situation in the State, especially in the Valley and on the recent operations conducted by the security forces,” an army official said. He said the army chief was briefed about the measures taken to tackle militancy in the Valley and prevent people from staging protests at encounter sites and engaging security personnel with stone pelting, thus hampering counter-militancy operations. The official said General Rawat reviewed the collaborative measures of security forces towards ensuring peace and calm in the region. “The army chief also interacted with local commanders and troops urging them to continue discharging their duty with utmost professionalism,” he said. Reinforcing the need to maintain a high vigil, the army chief also discussed the issue of stone pelting during counter militancy operations. He impressed upon all to synergise efforts with the other security agencies in dealing with such situations effectively. 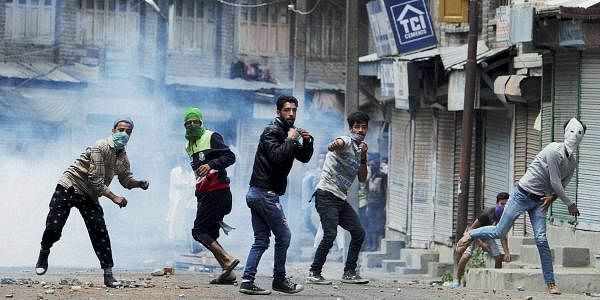 On February 15, the Army chief had warned that people creating hurdles during anti-militancy operations and displaying flags of Pakistan and ISIS in Jammu and Kashmir will be dealt as anti-nationals and will face harsh actions. His warning had prompted the State government to issue a fresh advisory on encounters. It has advised people not to move towards or assemble near encounter sites to avoid loss and injuries to precious human lives. The prohibitory restrictions will also be imposed within the radius of three kilometers from the site of any counter-insurgency operation in the districts. However, people have been defying restrictions, staging protests and engaging security personnel in clashes during the encounters. Meanwhile, the army chief paid homage to the soldiers Lance Naik Ghulam Mohi-ud-Din Rather, Sep Vikas Singh Gurjar and Sapper Sreejith MJ, who were killed in a militant attack in South Kashmir’s Shopian district on Thursday. He laid floral wreaths on the coffins carrying the mortal remains of the three soldiers. The army chief also met the injured soldiers at the Army Hospital in Srinagar and wished them a speedy recovery. Meanwhile, hundreds of people attended the funeral prayers of Lance Naik Ghulam Mohi-ud-din Rather at his native place at Panjpora in South Kashmir’s Anantnag district on Friday. A pall of gloom descended on the locality after body of the soldier draped in tricolour was brought to his native place for the last rites. 35-year-old Rather had joined Army’s JAKLI regiment on April 2002 at the age of 20. He is survived by wife Shahzada Akhter, one-year-old son and elderly parents.